NINGBO, China (Nov. 29, 2012). 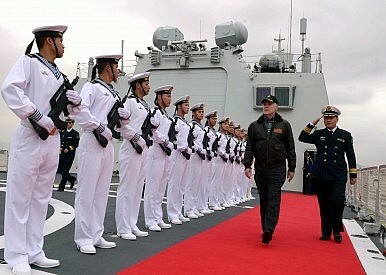 Chinese sailors render honors to Secretary of the Navy, Ray Mabus, during a visit to the People's Liberation Army Navy hospital ship Peace Ark (866). Secretary for the Navy Ray Mabus noted in his statement yesterday that the US pivot to Asia is continuing as planned. “Let me state this very clearly: our fleet is growing and will number greater than 300 ships before the end of this decade,” the navy secretary vehemently underlined. The U.S. Navy is requesting $161 billion (a $11.8 billion increase from the previous year) in funds for the fiscal year 2016 budget process. Mabus also emphasized that during his first five years as secretary, the U.S. Navy contracted 70 ships and purchased 1,300 aircraft, which is “is 40 percent more than the Navy and Marine Corps bought in the five years before this administration took office,”according to his testimony. Can the Littoral Combat Ship Really Put an ‘Enemy Fleet on the Bottom of the Ocean’?US Navy’s Fleet of Littoral Combat Ships Will Be Cut to 40 Vessels US Navy’s Deadly New Gun Won’t Be Ready for Some TimeDrone Swarms: How the US Navy Plans to Fight Wars in 2016 How Many Attack Submarines Does the United States Need?